Bring your family and friends out for a fun-filled afternoon of games, great eats and entertainment at the beautiful Hideaway Lodge in Woodinville! You won't leave hungry. We'll be supplying the hamburgers and hot dogs. You bring your favorite picnic side dishes and desserts to share! Water, ice tea and lemonade will be provided. BYOB of choice if desired. In addition to fun summer games for all ages, there will be a sound experience, scavenger hunt, chili cookoff, costume photo booth and more. Please let us know if you are coming. We're looking forward to seeing you there! If you're interested in volunteering, please let us know! You may email ContextCDC@gmail.com for more information. Location: Hideaway Lodge Bed and Breakfast. Click here to find the detailed directions to the Hideaway Lodge in Woodinville. If you have any questions, add a few sentences below and someone from the Context Community Committee will email you the information. ​ to help with food, drinks and games can be made here. ​100% of the funds will be applied to these community inspiring events. 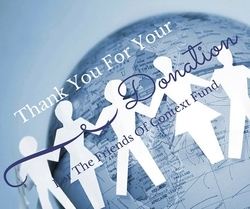 Click this link to donate to the Friends of Context Fund.